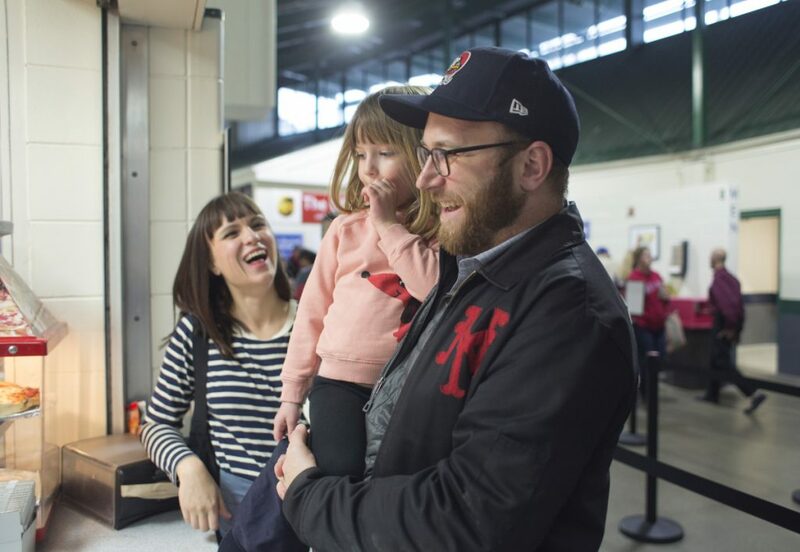 Briana and Andrew Volk, owners of Hunt + Alpine and Little Giant, aren't above eating cheese fries from a souvenir helmet. 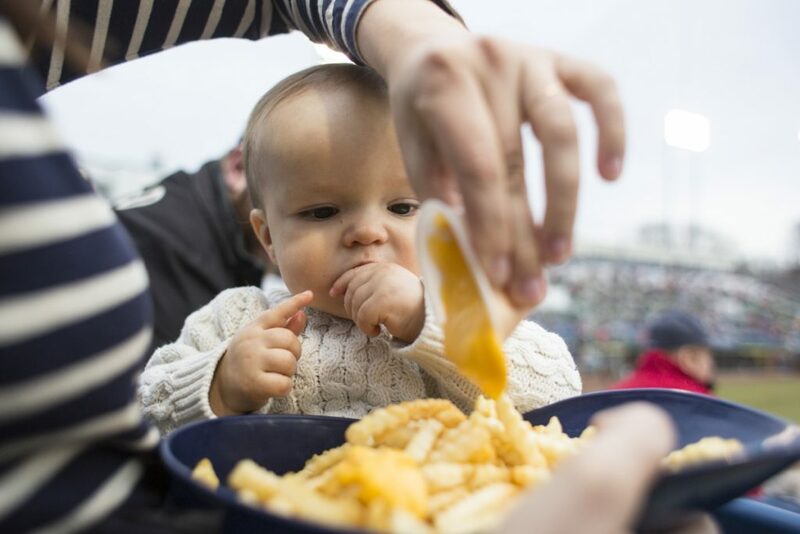 Portland restaurateurs Briana and Andrew Volk, with their 11-month-old son, Rockwell, watch the Sea Dogs' home opener at Hadlock Field on Friday. Their sandwich pick? Ballpark franks. The black and white menu board at the Hadlock Field concession stand where Portland restaurateurs Briana and Andrew Volk wait to order dinner just before the game begins lists the available options under baseball’s major food groups: Fried Foods, Candy, Ice Cream and Ball Park Fare; that last includes items like Cracker Jacks, pizza, nachos and hot dogs. Although the couple owns both a nationally known upscale cocktail bar and a highly regarded restaurant, dinner at the ballpark with the Volk family looks like dinner at the ballpark with just about any other fan: two franks with mustard and relish, a slice of pepperoni pizza (for their daughter, Oona), a jumbo pretzel with yellow mustard, a souvenir batting helmet stuffed with fries that are smothered in Creamsicle-colored nacho cheese, and a single Sea Dog Biscuit to be shared among the family of four. The cheese-topped fries are by special request of Briana, who calls them, affectionately, Sea Dog poutine. “I’m a big fan of french fries with the super gross nacho cheese,” she says. It is the season’s first home game: The Sea Dogs versus Binghamton’s Rumble Ponies. The Volks are season ticket-holders and serious baseball fans, who not only go to most Sea Dogs home games but can often be found in the stands at Fenway Park, too. Rockwell waits to taste-test the cheese sauce his mom is pouring on their fries. Their house is just a 10-minute walk from Hadlock Field, and their seats are excellent – about eight rows back and just to the side of home plate. Both played baseball as kids, right field for Andrew. “I wasn’t very good,” he says. Starting catcher for Briana, who played softball through high school. “I was good,” she says. Baby Rockwell (his parents call him “Rocky”) attended his first game last summer when he was just 8 weeks old. Four-year-old Oona is by now an old pro. She sports a Sea Dogs cap and, throughout the first inning, patiently, politely and persistently asks her parents for just two things: a visit from Slugger and some popcorn, please. When they are not attending baseball games, the Volks oversee Little Giant, a bright, attractive neighborhood spot in Portland’s West End; and Portland Hunt + Alpine Club, a Nordic cocktail bar with such imaginative and impeccably made drinks as Lily of the Tundra, which combines Allen’s Coffee Brandy with pineapple rum, bitters and amaro. 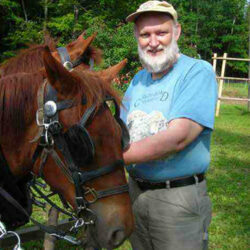 Both places have attracted enthusiastic national notice from the likes of Food & Wine and Bon Appétit. The restaurants proudly tout local farms on their menus and boast eclectic offerings like fried oyster tacos, all manner of deviled eggs and Arctic char with saffron Israeli couscous, English peas, pickled raisins and black olive oil. 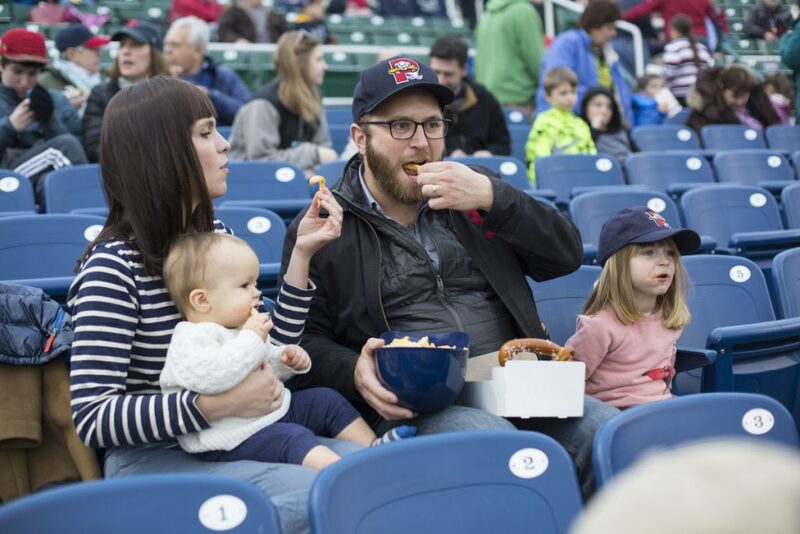 Portland restaurateurs Andrew and Briana Volk with their children, Rockwell and Oona, at the Sea Dogs home opener at Hadlock Field on Friday. 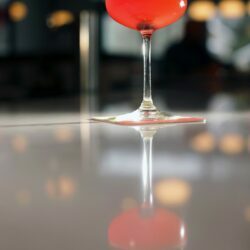 Although the Volks are not chefs – he’s a mixologist and general manager, she’s the company’s creative director – they’ve just written a cookbook, their first. “Northern Hospitality” features snacks and cocktails from Hunt + Alpine and is due out in September. For all their fancy food cred, the Volks seem to genuinely love baseball park fare. It isn’t their family’s everyday food. It’s their treat food. When corn dogs come up in conversation, Briana jumps in – “No joke, it’s probably my favorite food.” Asked for improvements to Hadlock Field’s signature menu item, the Sea Dog Biscuit, which sandwiches Shain’s of Maine vanilla ice cream between two chocolate chip cookies, they come up empty. Andrew shoots me an incredulous did-I-hear-that-question-right look. “I think the Sea Dog Biscuit is perfect. I wouldn’t want to change anything,” Briana says. Andrew Volk dresses his hot dogs. 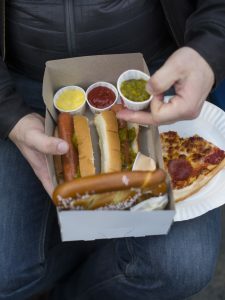 For the Volks, stadium food is not guilty pleasure. It’s all pleasure. How did he learn to juggle all these things? “Practice,” Andrew laughs. On this particular night, the family is drinking water. No soda. No beer. “You need some water to wash down all the fat,” Briana laughs. Before she joined her husband in the hospitality industry, Briana worked in advertising, writing TV spots for Macaroni Grill, she mentions, and dreaming of an elite career in baseball communications. She haunted the job listings at Major League Baseball, applying for openings more than once. “But they’ve never called me back,” she says, and is her tone wistful? Now she and Andrew share other baseball-related dreams. “We don’t have too many lifetime goals,” Andrew explains. “We’re not that sort of couple. But one of our lifetime goals is to go to every single stadium and see a major league game there. We’re about a fifth of the way there.” So far, Safeco Field in Seattle gets their vote for best food. 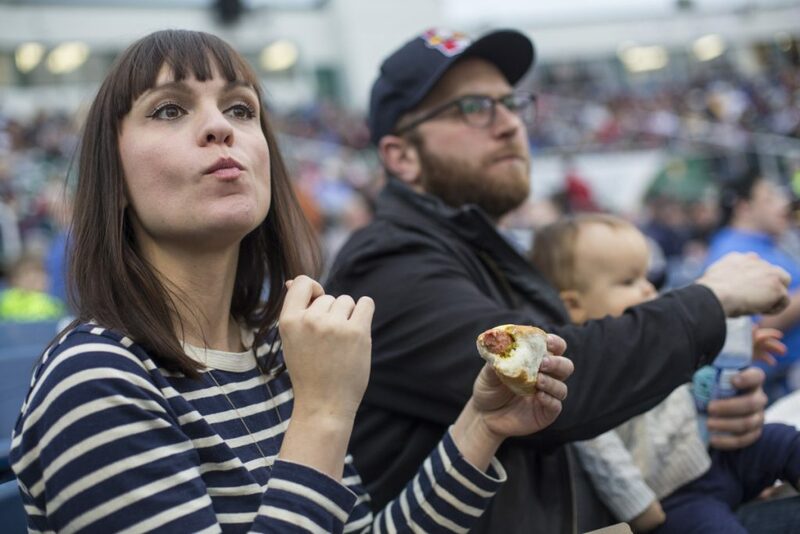 Portland restaurateurs Andrew and Briana Volk laugh as their daughter, Oona, makes her food choices at the Sea Dogs home opener on Friday. Do they have a corollary food-related plan on their bucket list – say, eat at every Michelin-starred restaurant in Paris? No, they do not. “Both of us are much more in-the-moment eaters than we are aspirational eaters,” Andrew says – as if, clutching cardboard boxes and baseball helmets of hot dogs, soft pretzels and orange cheese-coated fries, this isn’t obvious. We do too and your subscription gets you access to all the people and stories behind Maine’s dynamic food scene. 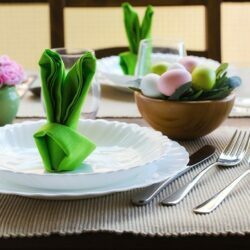 Not to mention the restaurant reviews, recipes and ideas for eating sustainably. They do have a baseball dining dream, however. Imagine if baseball classic eats at Hadlock Field were supplemented by terrific local foods, they suggest. “How great would it be to have Salvage BBQ here?” Andrew asks. This is not a question. Imagine further that Hadlock ”Field’s concessions manager is reading this story, and he likes your idea, and he acts on it. Would you yourselves give up watching the game to work the game?